Food & Water Watch is commenting on the European Commission’s directives on clones in the food chain that states food from offspring of cloned animals doesn’t need to be labeled. They say it falls “woefully short” of what citizens want. 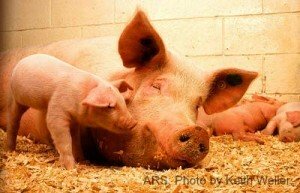 The draft laws only “provisionally prohibit” cloning farm animals, along with the sale and import of food from clones. The laws do not prohibit the sale of food from the offspring of clones. And the phrase “to preserve the competitiveness of Union farmers, the proposal does not regulate reproductive material of clones” means that farms can import and use that material and sell the food that results from it into the marketplace. Most troubling to food safety advocates, the draft laws don’t require labels on food made from cloned animals’ offspring. In other words, the EC’s statement means that the cruelty of cloning is enough to suspend the practice, but the regulatory cost of checking on label accuracy is just too high. There is no system in place to track the “natural offspring” of clones. Food & Water Water takes the position that cloning animals for food is unethical. Some scientists are concerned about the food safety aspect of this matter. Many cloned animals have genetic defects, harbor disease, have shortened lifespans, and carry concealed illnesses. While the FDA has said that milk and meat from cloned animals are safe to eat, consumer groups found the government’s analysis flawed and scientifically unsound, since it was based on limited research supplied from the cloning companies themselves. Cloned animals are more likely to have birth defects. Some cloned animals have very low survival rates. Many die in the uterus or shortly after birth. In addition, the cloned animals experience complicated births and can harm the surrogate animals. Epigenetic effects, which can create clones that are different from the original animal, occur because genes can be turned off or on through environmental factors or the cloning process itself. Cloned dairy cows may have chronic lameness, while cloned pigs usually have weakened immune systems. Most consumers do not want cloned animals in the food supply. But that food may already be in the marketplace. In the U.S., the FDA does not require labeling on cloned food. Without labeling, we have no way of knowing what we’re eating.